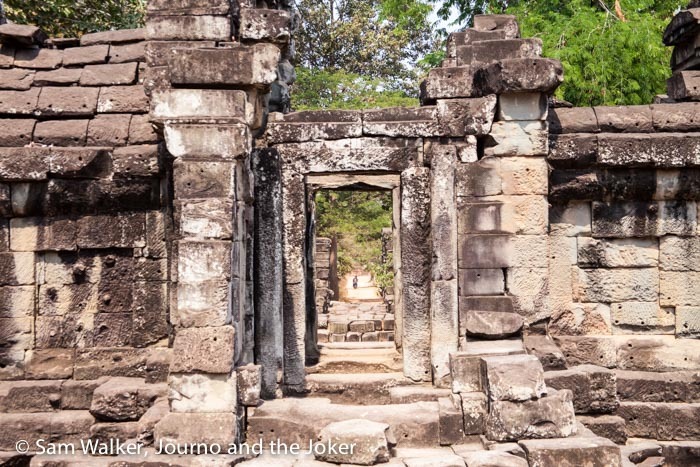 Happy, happy Khmer New Year! Phew! Finally the celebrations have come to an end. What a week it has been. 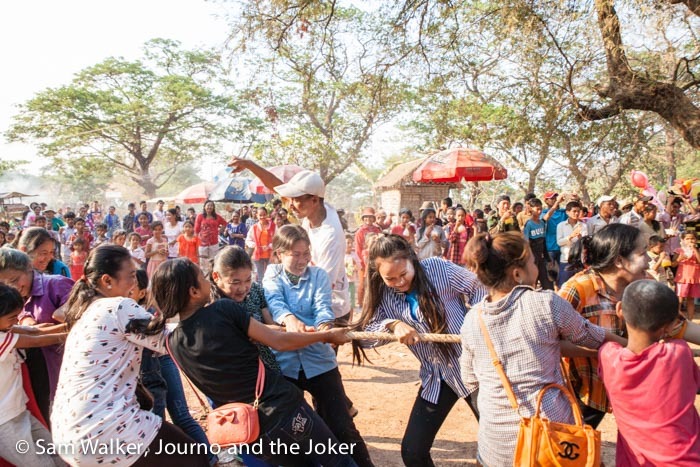 The Cambodians love a party and they really know how to throw a party — our friends Sophal and Bun Theun are no exception. And they are such gracious hosts. 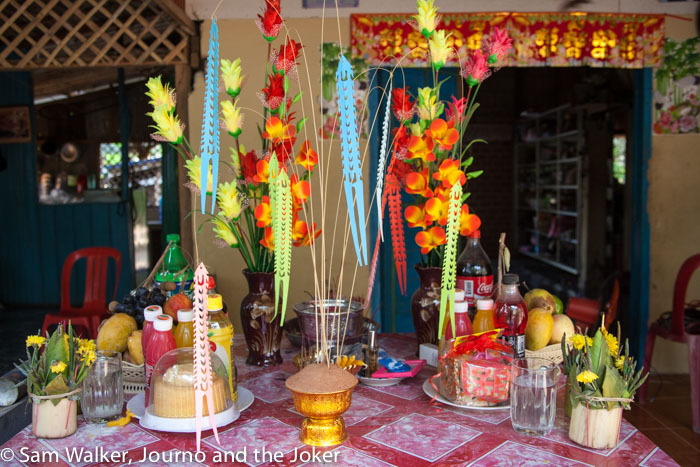 They invited us to their Khmer New Year celebrations, which took place over two days. 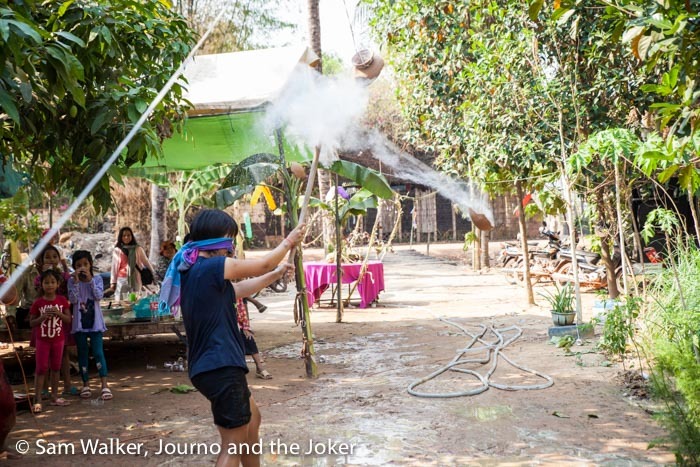 It involved lots of fun and frivolity, heaps of food, traditional ceremonies and games. Oh, and of course there was powder and water. 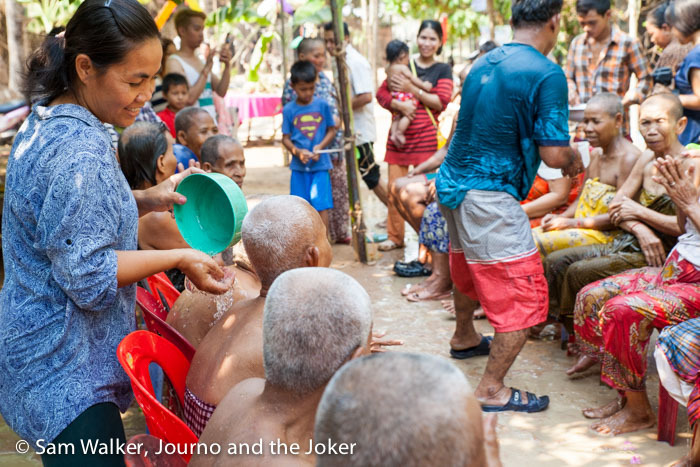 It seems Cambodians have adopted Thailand’s water and powder celebrations with great enthusiasm. We joined them for day two and three of this three-day celebration. Their house was decked out with beautiful decorations. And like every house in town, a table was set up with offerings to the gods. 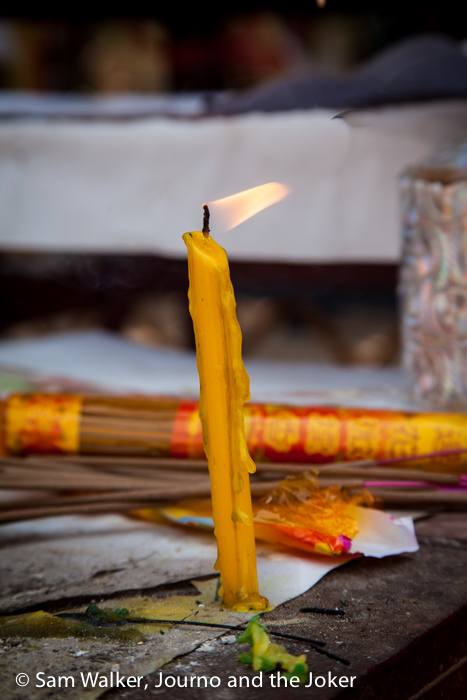 I believe this is to give thanks and ask for good fortune for the year ahead. 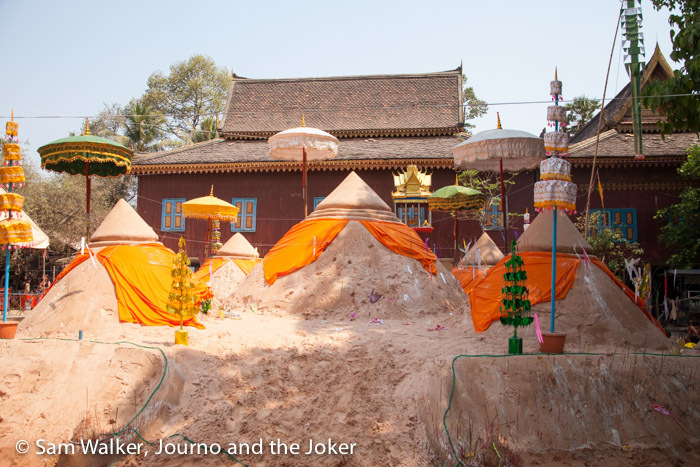 Sophal’s daughters took me to the Pagoda, Wat Atvea — just a few hundred metres down the road from their house to show me some of the traditional celebrations and the sand mountains piled in front of the pagoda. I haven’t found the reason for the sand mountains but they are at every pagoda. 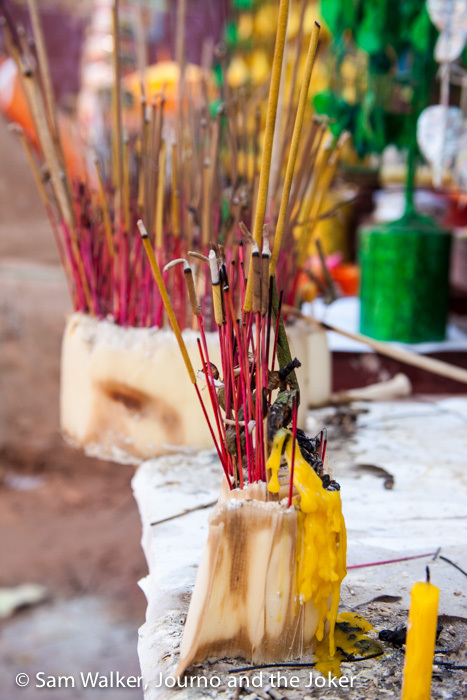 Candles are always being lit at these ceremonies along with incense (joss sticks). 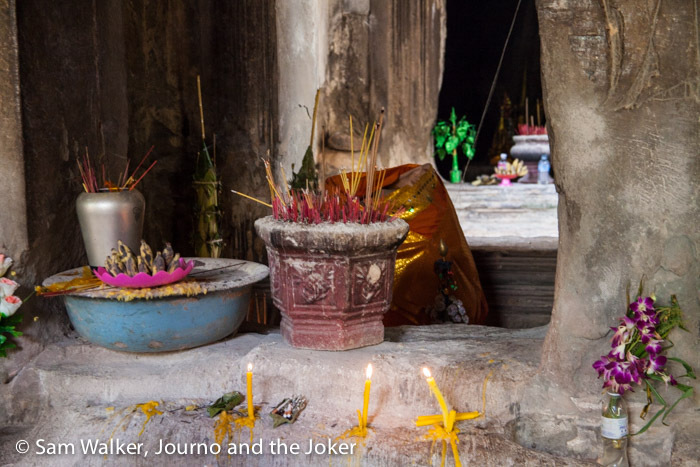 The girls also took me to the ancient temple at Wat Atvea, where many people were also making offerings to the gods. 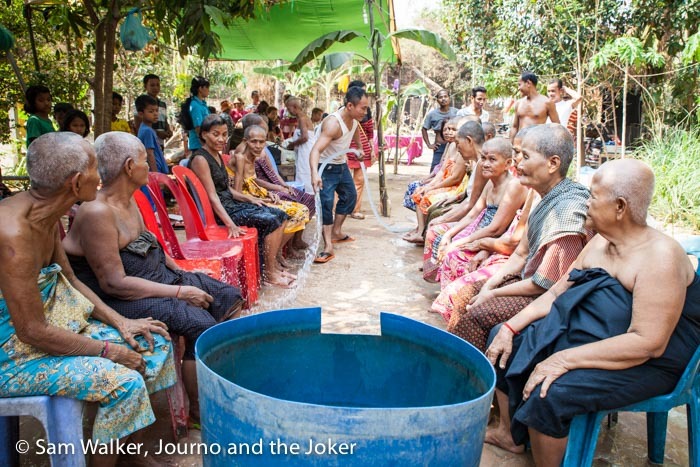 As we were leaving the yeays — grandmothers — were taking part in a ceremony. 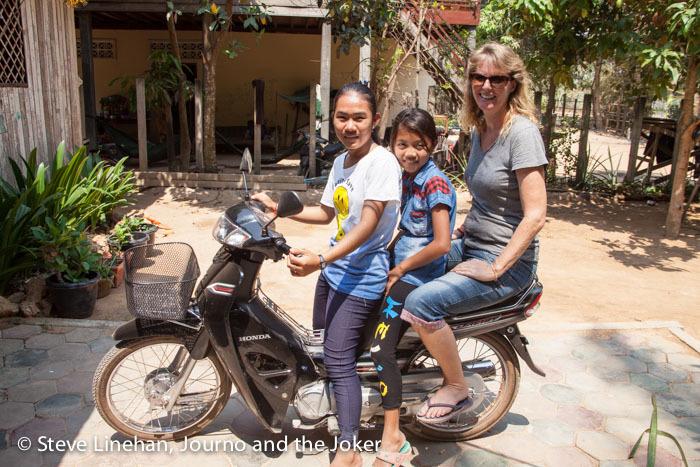 Then I headed back to the party with the girls — Khmer style. Yep, three up on the back of a motorbike driven by a 16-year-old. Fortunately, it was only a few hundred metres down a reasonably quiet road. We rejoined the party where there was plenty of fun and frivolity going on. 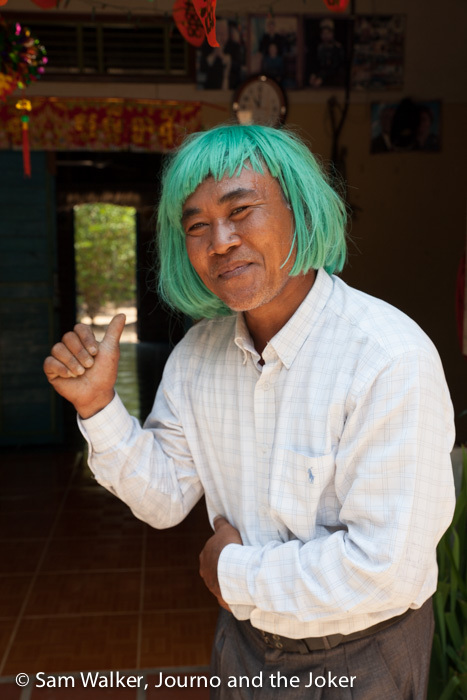 Bun Theun was in the spirit of things, donning a green wig and everyone was dancing. And, of course, there was Karaoke. 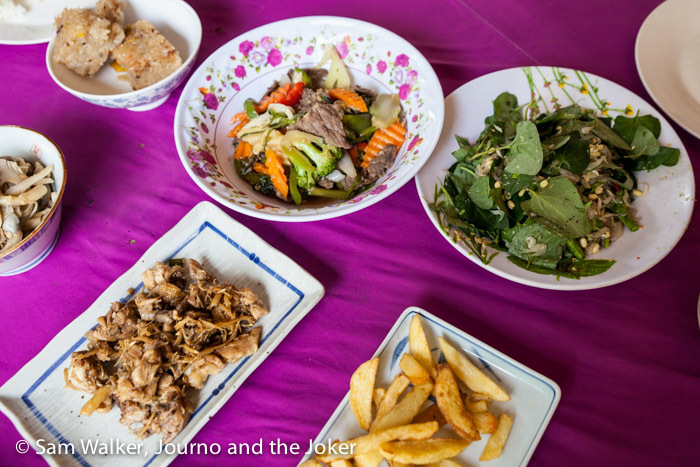 There is always food on the table at Sophal and Bun Theun’s. Sophal and her daughters and the neighbours are always cooking, chopping and cleaning. All too soon it was time for these two to say goodbye. 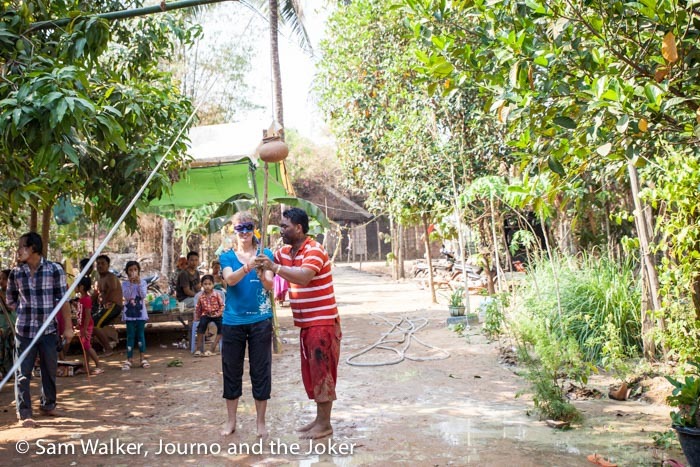 It’s been a great friendship between the Joker and Bun Theun over the past year. Many good times, lots of laughs and plenty of fondling. Perhaps I’m being replaced. And then we got invited back for another day of celebrations and to take part in the washing of the grandparents ceremony. This ceremony, from what I can gather, is performed on the old people — especially grandmothers — by their children and grandchildren. 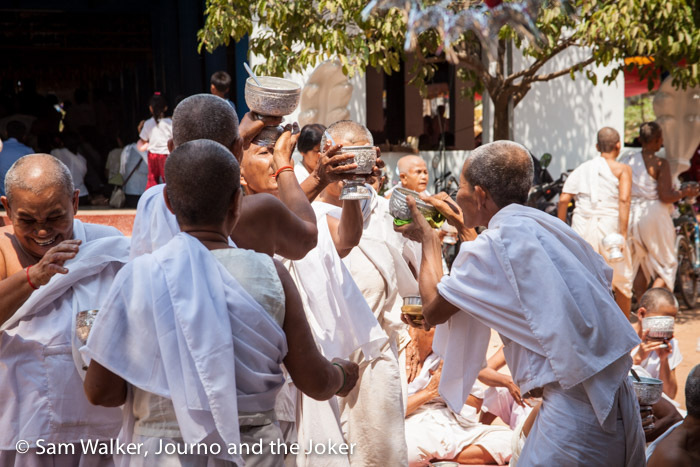 It is a lovely ceremony of respect (and a bit of fun, it is a Khmer celebration after all). As I understand it, it is about washing away all the dirt, bad luck, bad spirits etc from the previous year and creating a clean slate to welcome in the new year. 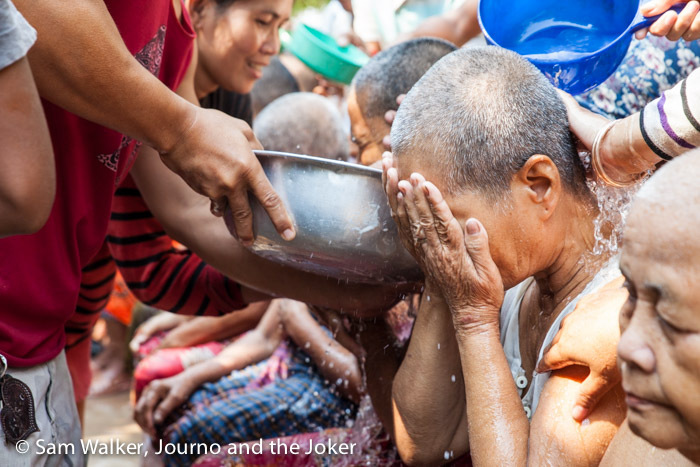 Of course, it doesn’t take long before the buckets of water are being poured over everyone and anyone close by is soon drenched. And then there were games. This one was like a Mexican Pinata. 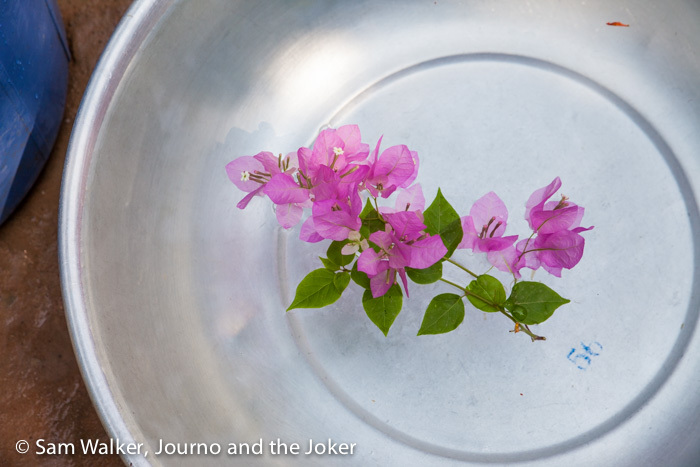 The little terracotta pot was filled with talcum powder and someone was blindfolded, spun in a few circles and then had to hit the pot and break it open. Very funny. There was much hilarity as the blindfolded person was left facing the wrong way and the guy controlling the pot kept moving it out of reach. 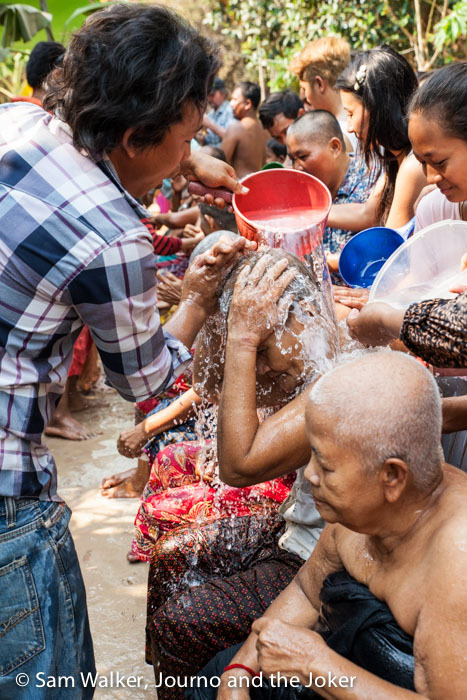 After all this fun and frivolity we headed back to the pagoda — on foot this time — to catch the end of the washing of the Buddha ceremony. 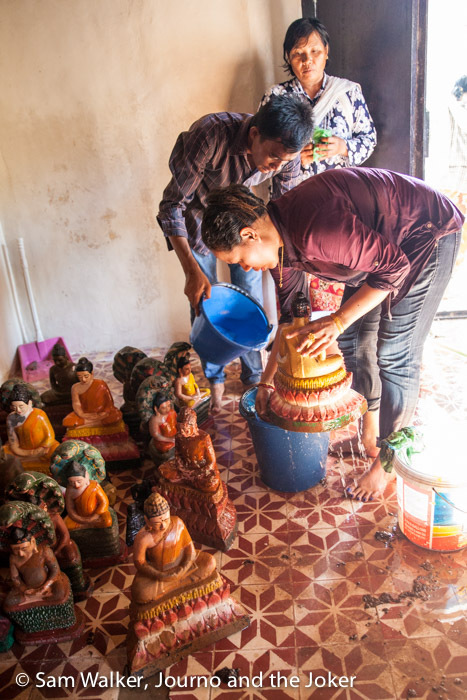 This is something that usually takes place on the last day of Khmer New Year and involves washing the statues of Buddha at the local pagodas. And there were more games. This time at the pagoda with half the village getting in on the fun. What an amazing few days and such wonderful experiences. There’s nothing like celebrating a festival with the locals. It’s such a privilege to be invited to share these days with this wonderful couple and their extended family. And we were welcomed so warmly by everyone. 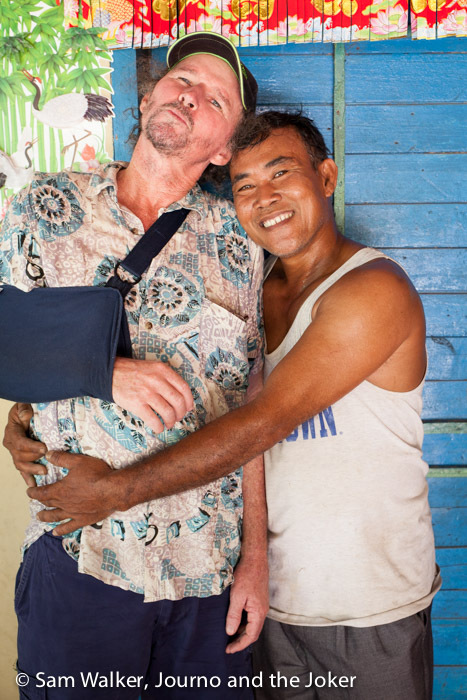 Thank you Sophal and Bun Theun. We will miss you. I love your amazingly colorful photos!